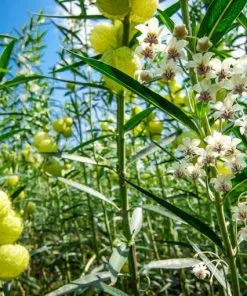 Asclepias physocarpa (Gomphocarpus physocarpus) milkweed has several common names like Swan plant, Balloon plant Milkweed, Oscar milkweed, and Family Jewels. 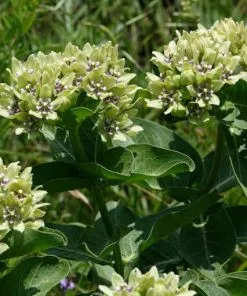 There are several other types of milkweeds but this is a somewhat unique milkweed and is one of the more favored host plants of the Monarch butterflies. The terminology for this plant is a little confusing. 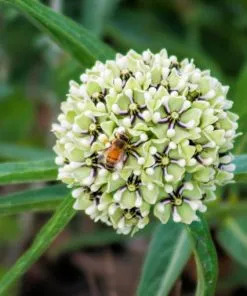 It is a native milkweed of South Africa and in 2001 its name was changed from Asclepias physocarpa to Gomphocarpus physocarpus to reflect that it is in the family of African milkweeds. 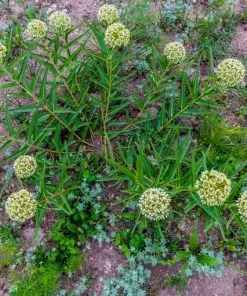 Now its true scientific name is Gomphocarpus physocarpus but many people still know it and refer to it as Asclepias physocarpa. 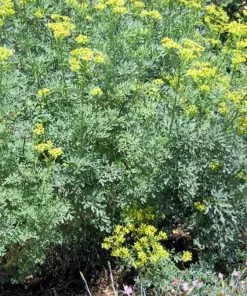 The other source of confusion is that it is very similar in appearance to Asclepias fruticosa (which has also been renamed to Gomphocarpus fruticosus). The difference is that G. fruticosus is a smaller plant than G. physocarpus and the seed pod is shaped a little different. For G. fruticosus, the seed pod is slightly oblong and can resemble a swan which is where the name “Swan plant” came from. 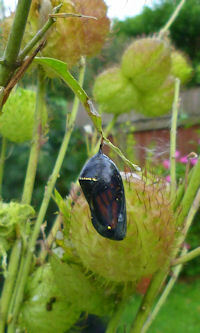 G. physocarpus has a seed pod that is more rounded and thus became known as “Balloon plant”. Now the two common names of “swan” and “balloon” plant are interchanged between both species. 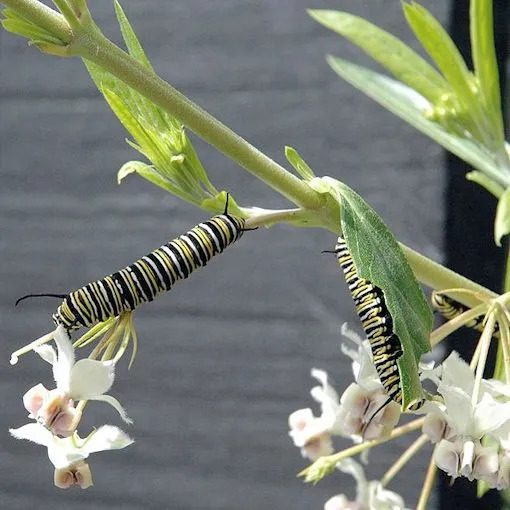 This article is focusing on Gomphocarpus physocarpus because this species is more robust and resilient to the hungry Monarch caterpillars than is Gomphocarpus fruticosus. Balloon plant has earned that name for a unique reason. 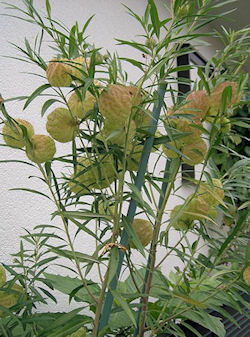 The seed pods of balloon plant are round balls about 2 to 2 1/2 inches in diameter. They are covered with soft bristles, which has also earned them the name of Hairy Balls plant. 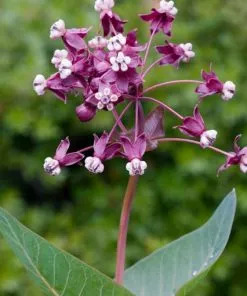 Most other milkweeds have longer and more slender seed pods. 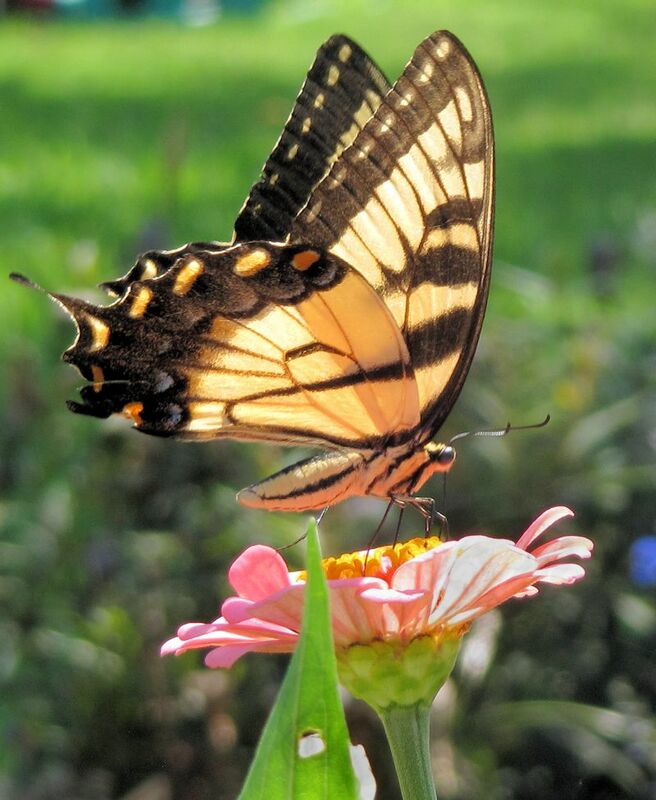 The flowers of the Balloon plant are pretty and attractive to butterflies but are not showy. It is the seed pods that become the real conversation piece when this tall milkweed is covered in them. They also look great in dried arrangements. Since the Balloon plant is native to South Africa, it is only a perennial in USDA Zones 8-10 (some say 9-10). It can be weedy in tropical areas. In the cooler zones it is grown as an annual. 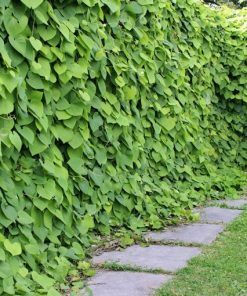 It is fast growing but gets large so this is one you may want to start indoors before the last frost or buy an already growing plant. This milkweed will get about 4-6 feet tall and about 3 feet wide. 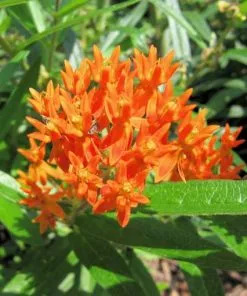 Balloon plant milkweed likes full sun and will grow in dry to medium moist (prefers medium moist) soil with good drainage. It will also grow well in large containers. 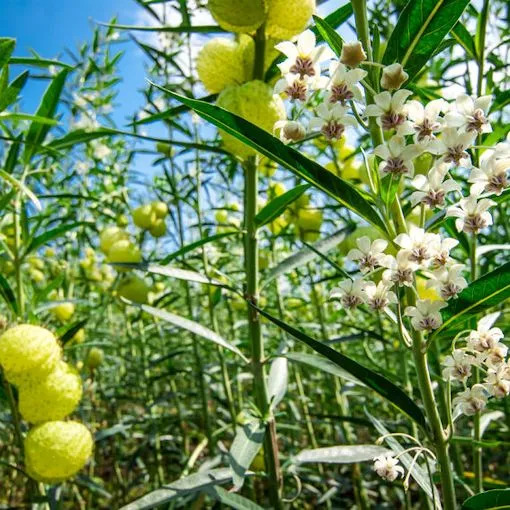 Balloon plant Milkweed is normally grown from seed. 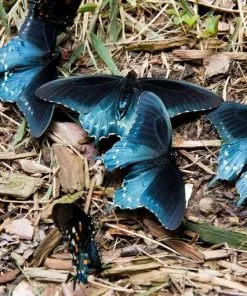 In Southern climates it can be fall-sown but in northern climates it is probably better to start it indoors in the early spring several weeks before the last frost. This milkweed seed does not need to be cold stratified but it is best to store the seeds, dry, in a sealed plastic bag in the refrigerator until ready to sow. Do not cover the seed when sowing and keep the soil moist and in bright light because light helps greatly with germination. 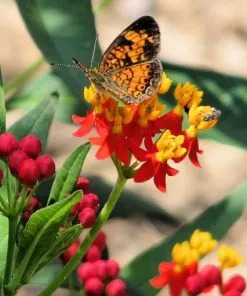 Since it is a milkweed from the tropics, the seed will germinate best in warm temperatures (68-80F). Balloon plant can take a while to germinate so give it between 15-30 days. 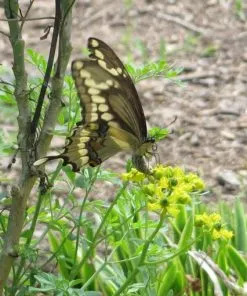 Balloon plant seeds can be collected in the fall for replanting in the spring and for sharing with friends, family, or butterfly projects. 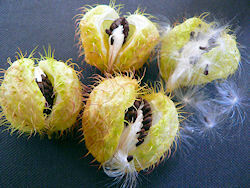 To collect the seed, let the pod dry and turn rosy-tan colored so the seed can mature. Before it opens, or right as it starts to open, break it the rest of the way and strip the seeds from the white “silks”. The seeds should be brown/black and dry looking. Dry completely before storing. 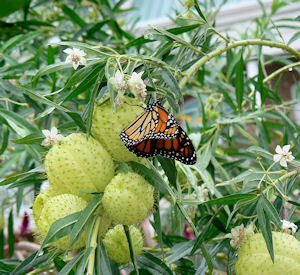 Gomphocarpus physocarpus is usually listed as one of the most attractive milkweeds to the egg-laying Monarch butterflies. 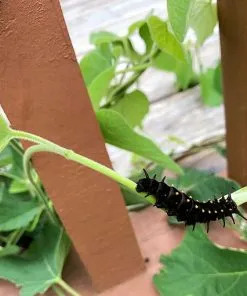 It certainly is a unique milkweed and I hope you will consider planting some for your butterflies! 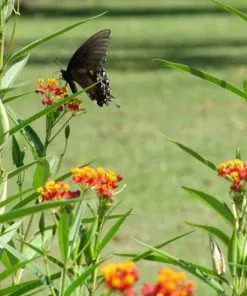 Many butterfly gardeners like to have several types of milkweed. 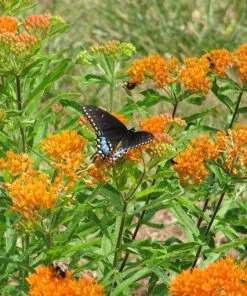 You may want to consider some of these milkweeds as well. 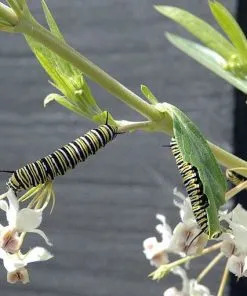 Also, we have an article about raising Monarchs if you would like more information.